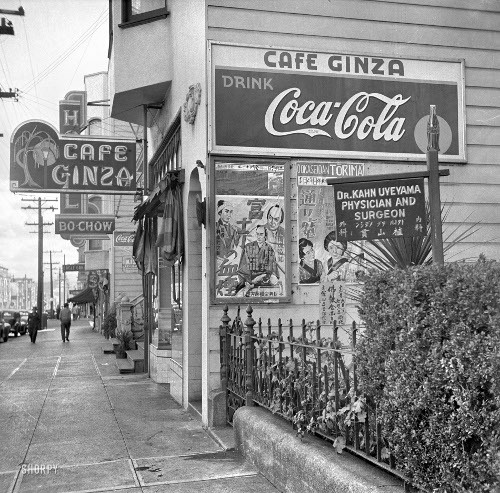 This is the photograph of Cafe Ginza at Buchanan Street in San Francisco on December 9 1941. Both films were shown in the Kinmon Hall on December 6 and 7. It says so on the very top of the poster. Two movies, O-OKA-SEIDAN and FUJIGAWA were produced by Shinko Kinema, the movie company specialized in quickies. Well, you may call it Monogram of prewar Japanese cinema, Republic Pictures of the Samurai Land. These two movies seem to be two of those quick, cheap, entertaining fares of weekly productions. These films are not listed in NFC-MOMAT archive database, I’m afraid. 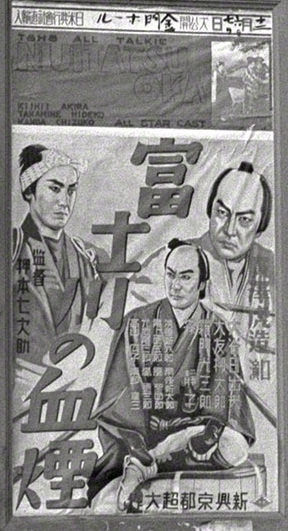 NIJI NI TATSU OKA was an early TOHO production, starring Hideko Takamine. The print of this film survived, but I haven’t seen the film. I don’t know if Japanese American community at the time had their own movie theaters in the area. Was Kinmon Hall the theater dedicated to Japanese shows? The small flyer attached to the poster says O-OKA-SEIDAN was going to be screened at Bukkyo-Kai Hall. I imagine that the Japanese Buddhist Temple nearby had the Hall for various activities for Japanese Americans and Japanese movie screening must have been one of them. The movies are always with us. They witness the critical moments of our time.